This was a relatively late comer into the S-100 Bus boards arena. From their name it was clear that they targeted the industrial based market rather than the home/hobbyist community. The actually manufactured a wide range of S-100 boards. Al Fiegehen and Don Lehr founded Industrial Micro Systems in Southern California in the late 1970’s. They engineered and manufactured a socketed 8K S-100 bus static ram board (C00232). The boards underwent rigorous in-house testing prior to shipment and proved to be highly reliable. They soon (1978) produced a second 16K static ram board (C00282) which rapidly became an industry standard for S-100 static ram memory. By 1979 the company had developed a complete line of Z80 S-100 boards and began selling a turnkey CPM based computer system. These computers had an I/O board (model 440) with a power-on IPL boot ROM which eliminated the need for a front panel switchboard. The computers also had a tape backup using an Alloy DS-100 tape controller. Soon after this the company moved their facilities to Carson City, NV to take advantage of both favorable economics and commercial land. In 1981 the company introduced its Series 5000 (w/5.25” floppy drives) and the Series 8000 (w/8” floppy drives) computers. They were S-100 bus, CPM 2.2 based systems which had a robust linear power supply and a nickel plated steel chassis. The company also changed its name to “IMS International” and expanded its sales into the European market. It should be noted here that in 1988 Cubix bought out InterContinental Micro Systems (aka MuSys) which was a Los Angeles based competitor that produced a similar line of S-100 master/slave boards. However, Cubix was not interested in InterContinentals S-100 products, but rather wanted to obtain ICM’s QuickLink board technology, which turned IBM XT/AT type computers into multi-user systems. The company is still in business, now producing blade servers. See http://www.cubix.com. The 186 Master processor card did not have on-board memory, the A1260 card provided the RAM for the whole system. All of the user processors have on-board memory. You will notice a 26 pin ribbon cable connecting the processor cards, this was called the S100+ Bus, and was used for communication between the master and user cards. There was also a daisy chain cable connecting all processor cards, used for priority select and addressing. The rear panel of the chassis has the RS232 "paddle boards" attached, these provided support to the rs232 outputs on the processor cards. The system had an 190 MB Maxtor XT-2190 hard disk and a half height QUMETRAK 242 8" floppy drive. Each processor had its own onboard EPROM monitor software. 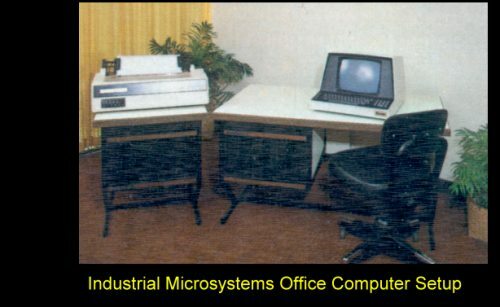 In the early 1980's IMS were well known as the suppliers a complete word processing, data processing office setup system complete with a removable platter 16MG hard disk storage system. There were two systems, both systems contained a 12 slot S-100 motherboard. 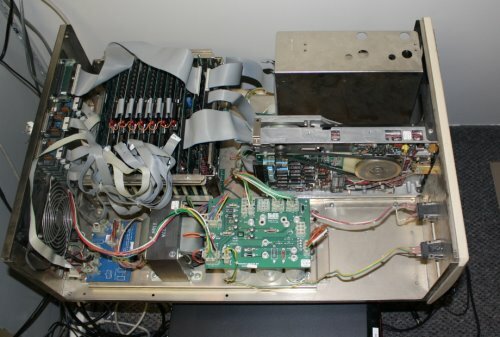 One unique aspect of the later IMS systems was that peripherals were handled using an array of "Personality" boards that attached to the parallel and serial ports of the cards. There were hard disk and floppy disk "Personality" boards as well as RS232, modems, and a RTC board. Documentation about this can be seen here. A good summary of the S-100 boards that make up the IMS 5000 series can be seen here.